I remember a comic like this a long time ago. Didn’t you do one before? Yes! 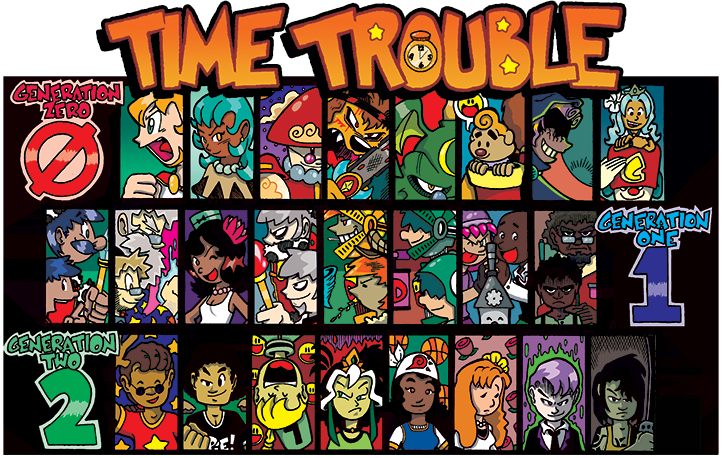 The current versions of Chip and Walter and Time Trouble are reboots of older comics I drew starting around ’00-’01. Their online life began as class assignments for school and wound up becoming something more. The original comics ran for over 150 strips (300+ combined if you count the EX strips). I stopped working on them when I got hired to draw the Sonic the Hedgehog comic for Archie, my first professional gig. Why are your updates spaced so far apart? All that info is available on the FAQ page for my main website since that’s where the majority of my contract work is discussed. Will you put up the old strips so I can look at them? Yes and no. When I did those old comics I was terribly inexperienced. I feel the same way about my earliest Sonic comics. To be honest, outside of a few strips that people remember fondly, I kind of hate to look at them. I didn’t feel they were a good representation of what I could do. So, after a lot of thought, I took them down and never put them back up. Ultimately, the old strips will be on my Patreon, where I’ll use them as updates in conjunction with current updates/storylines to compare/contrast/talk about my process. At least that way, they’ll still get mileage and serve a purpose for people who really and truly want to see them again. If I read the old comics, how much has changed between the new and old versions of the strips? For Chip and Walter, the story is roughly the same up to a point – the biggest additions being Violet, who wasn’t in the old strips (but who was another brother -?!? !- in the material that existed before its original online inception!) and the introduction of very important characters who came later or I never got to early on. For Time Trouble, the story is WILDLY different with similar beats and a few name changes. For one, all three generations will get equal focus and tie into each other to tell one large story, whereas before, it was just Generation Two with snippets of Zero and hints of One. The goal for the reboot is to slow down the erratic, often-nonsensical lightning pace of the old version and let the story breathe/tell itself more naturally. Less forced gags, interruptions, more focus on getting to know the characters, blah blah blah. Hopefully, I will have achieved that in the end. Do I need to read one comic to understand the other? Chip and Walter and Time Trouble will always remain totally independent of each other in terms of their specific story lines. What kind of animals are the NSFFS Corporation? What is that goofy looking thing Walter always wears on his head? It’s an old school doctor’s headlamp. Look it up!